This morning I listened to a podcast from the Diane Rehm show from National Public Radio. 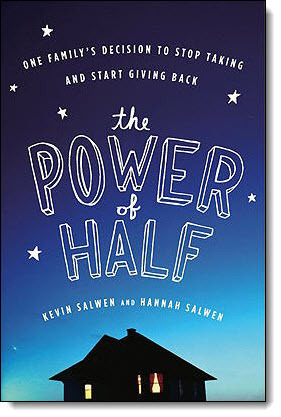 In it, the host subbing for Diane interviewed Kevin Salwen and Hannah Salwen, the father-daughter authors of the book The Power of Half. 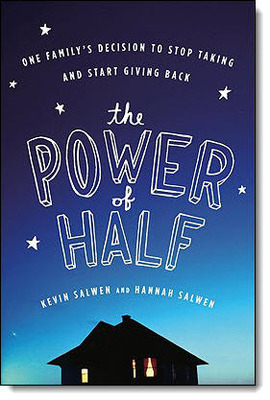 The book documents the path the Salwen family took when they decided to sell their house and move into one half its size, donating half of the sales price to charity. Along the way, they also changed many of their consumer habits and starting making more time for their family and their community. It is an interesting story and one that illustrates the idea that most of us could probably get by with less than we have, and probably could give more of our time, money, or talent than we currently give. The first category was complaints that while they had given half of their stuff, the Salwens were so well-off (upper middle class, it seems) that they still have a very comfortable life afterwards. They’ve never really known “need” so we shouldn’t see them as a good example. Plus, Jesus taught that we should only do good works in private. No need to make such a public splash about it. The second category was complaints that the Salwens are out of touch with ordinary people and that in these tough economic times, there are many people who can’t afford to give half their stuff to charity (which Kevin Salwen specifically said at the start of the show they were not advocating that people do). “Flippant,” “insensitive,” and “disconnected” were some of the words used to describe the Salwen family. There was also a small category of people criticizing that the primary recipient of the family’s charity is an organization that fights hunger in Africa. “There is great need in our own country!” some people complained. Now, this really amazes me. This family examined their own life, realized they enjoyed a cushier lifestyle than they needed, and acted on that realization. In my mind, that’s a good thing. Who are we to criticize that? As near as I can tell from listening to them, it was done with the best intentions and the only reason they have publicized the story is to encourage others to think about what they could potentially do without in their own lives – a message that I think doesn’t hurt the vast majority of Americans, even ones who are in financial tough times, to hear. What is it with this bitterness? If you don’t think the family deserves praise, then don’t praise them. But why do some people feel a need to attack them and tear them down? Spend half of the time you would have otherwise spent attacking them and use it to do something that betters the world! This entry was posted in Uncategorized and tagged Charity, Diane Rehm, Giving, NPR, Power of Half, radio, Salwen by christao408. Bookmark the permalink. I agree with you. I think they try to do a good thing and encourage others to do the same. People should praise them. Still trying to think so many people criticised? There will always be a cynic or bitter person out there that will say something. It can be annoying. Right on! Seriously, I think people too often use negativity as a means to attempt to bolster their own egos. “If I tear them down some, I won’t look as bad” mentality, though of course that kind of mentality is often an unconsious trend in their lives. What this family did was very commendable. I wish I had half their gusto. A first reaction to an example of living right is to defend the position of living wrong… The naysayers would be admitting wrong in their conspicious consumption if they commended the Salwens. If “tough” times are an excuse for greed then there are serious problems in our societal psyche. We have 3 cars – we really don’t need any and could manage with only one… We have a large home and could still live well with 2 bedrms instead of 4… The examination of self is an ongoing and sometimes painful process especially when we don’t like what we see. I really dislike the way the public always has to find fault with people who are trying to reach. It appears that their own envy and shortcomings make them gripe and, because they cannot do anything worthwhile, they would rather pick on some others. It is a curse of our society to feel they can justify their angry outbursts. I remember hearing this show. I love Diane Rehm. Hope she returns to NPR soon. She has been gone a while. People are bitter because many people condemn wealth and act like you HAVE to give your money away or you don’t care about anyone else. It’s a reaction to real pressure that does exist. I agree with Senlin’comments above and wonder what the family will do with the proceeds from their book, which, if they keep, could well give them back at least some of what they gave away and maybe this is part of the reason for the negative responses. HOWEVER, I also think that what the family have done should be commended not criticised. It seems the wealthy can’t do right for doing wrong – if they keep their wealth to themselves, they are ‘greedy’ and ‘selfish’ – if they share it like this family has done, people still find cause to criticise!The bottom line is that they have tried to do something to help others, it’s not for us to pass judgement on their methods or motives – I doubt the starving people in Africa will be doing so ! Really enjoyed this post. The book sounds like an interesting read. You know, there is no pleasing everyone. No matter what we do, there will always be detractors. As long as we believe in what we do, we sometimes just have to ignore other people’s negativity. @Chatamanda – My understanding is that half the proceeds from the book are going to the same anti-hunger cause in Africa and the US publisher is also donating $1 per book to another domestic organization. @epiginoskete – Glad you enjoyed it. I’d like to read the book, too. @KoSaowanee – I wonder if they are carrying it yet? @icepearlz – @NightCometh – @ZSA_MD – @murisopsis – @everyday_yogi – @Roadlesstaken – @stevew918 – @lil_squirrel4ever – @Senlin – Thanks everyone for your thoughtful comments and for participating in the discussion. @christao408 – That sounds great ! I’m sure the recipients will be very grateful for this money. I believe that I saw a television interview with this family a few months ago. I didn’t know that there was a book. I think it’s an interesting idea. We humans tend to get very tied to our things whether we have a lot or a little. I put this book on my to-read list. There seems to be a lot of anger out there. I don’t think even Mother Teresa would have gotten a fair shake. Even if people can’t give away half, they can give something – even an act of kindness.